Well, this is embarrassing. A friend in the States sent me a link to a Washington Post story. 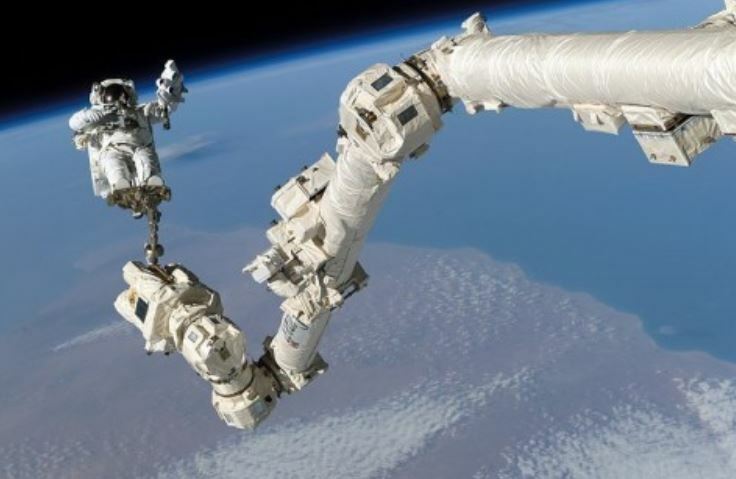 Along with the link, he sent a short note: “So much for your Canada Arm.” You see, I had bragged about Canada’s amazing engineering feat – a robotic arm that can pop the top off an ice-cold Molson while orbiting 400 kilometres above the Earth. Yes, Canadians designed and built that dexterous appendage of utilitarian mechanics. “Not so quick,” said my friend. I had to swallow hard when I saw the Washington Post photographs myself. The Post had copied a picture from Discover Canada: The Rights and Responsibilities of Citizenship, a page on the Canadian government’s immigration site. That picture is reproduced above, but it has since been pulled from the several government sites that hosted it. For good reason. This is not what the astronauts saw. They saw the scene below. See if you can spot the difference. The original NASA photo was doctored into something apparently more suited to a Canadian government web page about the “rights and responsibilities of citizenship.” I guess honesty and integrity aren’t essential responsibilities of citizenship. “CANADIANS are known for humility. But leave the Earth’s surface and you’ll find the country’s ego somewhere up in the thermosphere. Canada’s government websites use doctored photographs of its contribution to the International Space Station to call special attention to itself. This is quite a dismal drop in our prestige. Canada had been riding high on the achievements of our singing astronaut, Chris Hadfield. Of all the space station chiefs, none was as capable as Hadfield. He was the first Canadian space walker. (I can only imagine the guts, skill, and confidence that would take.) Hadfield popularized space exploration just as it was becoming a humdrum affair. (My youngsters were as awed as I.) After Commander Hadfield’s brilliant work and the tireless efforts of hundreds of other Canadian space scientists and engineers, we are now seen on the world stage as imposters. This scandal is a disservice to Canada’s space legacy, but the scandal is not entirely unexpected. Our recent history has been one of sour and strained relations between Canada’s scientists and Canada’s government. It is symptomatic of a deeper problem. Last year, the Professional Institute of Public Service Canada (PIPSC) commissioned a survey “to gauge the scale and impact of ‘muzzling’ and political interference among federal scientists.” Over 4,000 of the country’s 60,000 public servants (including 20,000 scientists) in federal departments and agencies were polled. “Hundreds of federal scientists said that they had been asked to exclude or alter technical information in government documents for non-scientific reasons, and thousands said they had been prevented from responding to the media or the public,” according to the survey results. Gary Corbett, president of PIPSC, said that the scientists “say themselves, ‘We live in a climate of fear. '” What do they fear? Taboo topics include environmental science, studies of ozone depletion, statistics on aboriginal health, status reports from fisheries, waterways, and occupational hazards. Breaches are reported by government “minders” who have the Orwellian task of accompanying federal scientists to conferences and reporting home on any scientists who become unleashed or unmuzzled. It would be better if there were more support for science and scientists, and less emphasis on glossy policy salesmanship. Because of the website blunder, there are people all around the world who have read the Economist, Washington Post, and dozens of other papers’ stories. They now doubt Canada’s contribution entirely. However, the fact remains that there really is a Canadian arm in space, developed by Canadian robotics and space scientists. It is a shame their reputations have been sullied – but they best not complain lest the minders report their thoughts. We would have preferred to see the Photoshopping money spent on unfettered science, research, and exploration – not on a computer graphic rendering of science, research, and exploration. Unlike a doctored space photograph, the damage done by the past half dozen years of muzzled scientists and stripped research budgets can not be undone by a simple cut and paste. 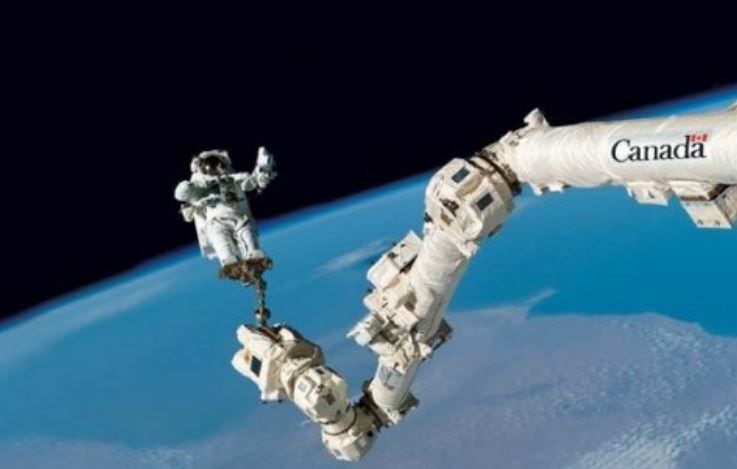 This entry was posted in Culture, Exploration, Space and tagged Canada, Canadarm, Canadian government, exploration, space. Bookmark the permalink.